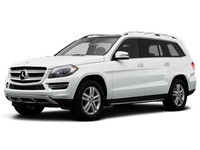 The Mercedes-Benz GL-Class is a full-size luxury SUV built at Mercedes' Tuscaloosa, Alabama, plant alongside the midsize M-Class SUV and R-Class luxury wagon. This is Mercedes' biggest SUV, with three rows of seating and plenty of cargo space. If you're in the market for such a vehicle -- and value on-the-road comfort and manners more than ultimate off-road prowess or tow capacity -- you'll definitely want to check out the GL-Class.